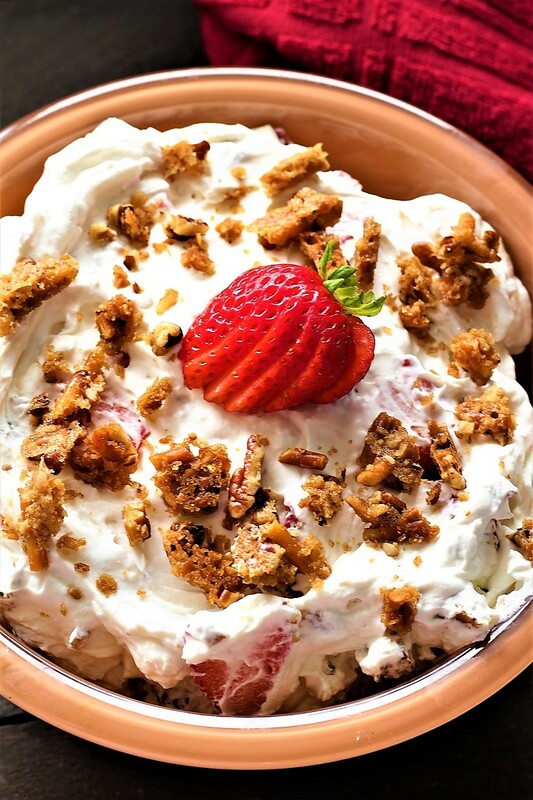 Strawberry pecan pretzel salad is a must to add to your Thanksgiving dinner. I got this recipe from a friend named Michelle. I had strawberry pecan pretzel salad at a dinner one night and I told her that I just had to have the recipe. She was kind enough to give it to me. It is just like pretzel salad, however it is a lot easier. The only thing that I must tell you is that you really need to eat it the first day, otherwise the pretzels and pecans go a little to soft. I had to laugh when my husband told me that if he would have known that it went a little too soft, he would have made a pig of himself and eaten it all the first day. Ha ha. Yes, it really is that good. I am so excited to get together with family this year. I really love when we can be together as a family. We will miss our son who lives in Idaho, as he will be on call and cannot make it. The rest of us are going to have a great time and we hope that we will also have a few other people show up that we have invited. So this last weekend we watched our cute granddaughters. I do know why you have your kids while you are you, even though they slept all night and they where pretty good, I must say that for some reason, they take your energy and just keep going! My son has his dog that is a German Shepard/Dutch Shepard, and the dog loved the girls. We let him come in the house while it was cold. (He is an outdoor dog). He sat in our laundry room. He was very good with the girls, he would drop his tennis ball that he loves and they would roll it to him. Then he would drop it and give it back to them. Then the little one that is 1 1/2, she went into the laundry room to pet our older dog that is 14 years old, and this young puppy decided that he wanted to kiss her and he started licking her. She did not like that one bit, and she cried. Then he looked at her as if to say, ” what is all the fuss about, I just gave you more love than one could handle. Ha ha. That puppy that is huge and my little granddaughter remind me of each other. They both have to be watched and they both need a lot of attention, or they like to get into mischief. Both cute, but also very full of energy. I must say that I am ready for this dog to get past the puppy stage. I will be making strawberry pecan pretzel salad for Thanksgiving. It is delicious, it almost taste like a toffee pretzel. I am pretty sure that you could also use raspberries or any fresh fruit that you desire. However, you do not want a fruit that is going to have a lot of moisture, or the salad will go soggy. One thing with the strawberry pecan pretzel salad, if you taste the pretzels ahead of time, it is hard to not want to eat them. They are so yummy. Candied pecans and pretzels together. However if you do not have a lot of people coming for dinner, you just might want to half the strawberry and pecan pretzel salad recipe. Well, my friends it is time to get to the store and get all of my groceries for Thanksgiving. It will soon be here and I want everything to be just right. I will let you know how our turkey turns out this year. We are going to try Spatchcocked Turkey this year! It is suppose to cook fast and be more moist. Spatchcocked turkey is when you take out the back bone, and then you break the breast bone and flatten it out on a big pan and cook the turkey. Oh ya, if you haven’t taken your turkey out of the freezer yet, you might want to hurry and do that as soon as you can. Again we want to tell you how much we love and appreciate your support. We are most grateful for all of you, and we wish you the best Thanksgiving ever. Hugs! 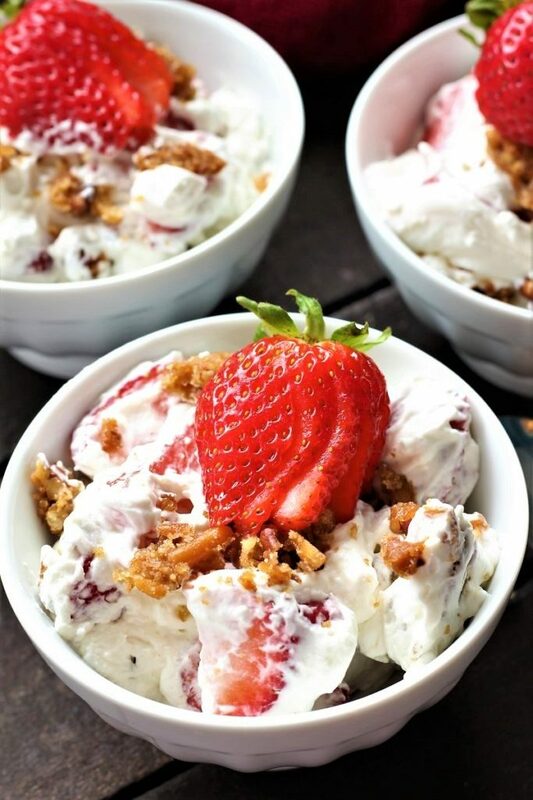 1- If you like strawberry pretzel salad, but only have a few people eating, half the recipe. 2- Use any fruit that you like. 3- You can use whipped topping or whipped cream. 4- Put the fruit and pretzels in, right before serving. In a large bowl, or a baggie, crush the pretzels. I like to put part of my pretzels in the blender for just a second or two. However, I do not put all of them in, otherwise they tend to get too ground up. Then add the pecans, sugar, and melted butter to the pretzels. Spread them onto a baking sheet or in a cake pan, spread them out pretty thin. Bake in the oven at 400 degrees for 7 minutes. When the mixture is done, remove it from the oven and allow it to cool. In a separate bowl, whip the cream. When the cream is whipped, add the confectioners sugar, and the vanilla. In a separate bowl, mix the cream cheese with a hand mixer. Then stir in the cream mixture, just until mixed. Just before serving, stir in the diced or sliced strawberries. 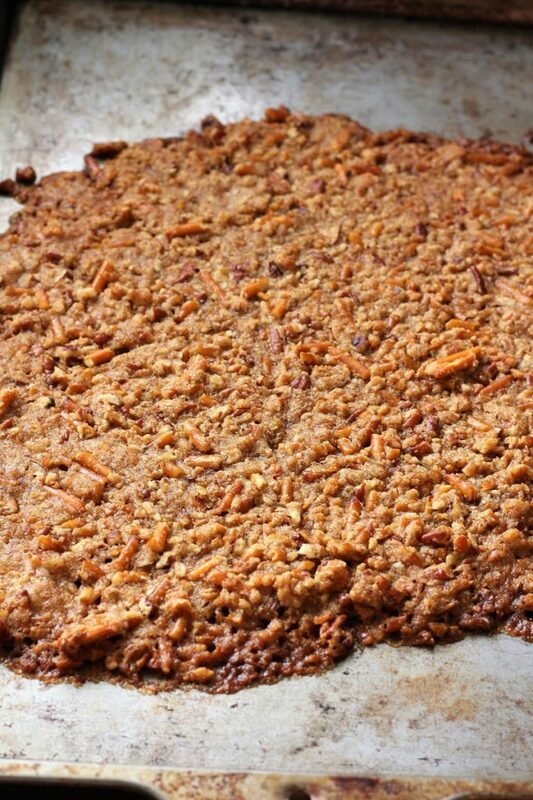 Take the pretzel and pecan mixture and brake it into smaller pieces. Add it to the salad as well just before serving. It really is quick and delicious! Thank you!